We don’t compromise on quality. It forms the basis of the trust you place in DICOTA. Customers worldwide have trusted DICOTA for 25 years to protect and transport their electronic companions. These devices contain valuable professional and personal data deserving of maximum protection. The company’s position as a quality leader is based on its strict material and processing philosophy, continual testing and comprehensive test procedures. Load requirements are already defined during product development and then rigorously implemented. Durable material, hard-wearing plastics, tear-resistant threads in the seams, high-quality zips and sturdy metal parts on the load points are the foundations upon which long-lasting solutions are built. We pay special attention to product ergonomics. Your health is important to us, which is why we look out for well-padded carrier systems and use breathable materials. Our backpacks and bags offer optimal comfort even when used over a long period. Sophisticated design and selected materials alone are not enough. The manufacturing process and careful processing are crucial for outstanding quality. We only commission suppliers who work according to our quality standards in the production of our products, but who also observe social and ecological requirements for manufacturing the products. In this process, we actively take responsibility for social and ecological standards. Read more here. We continually test that the products adhere to strict quality requirements right from the moment they’re produced to when they are sold. We conduct mechanical tests to ensure that the materials are up to the challenge of everyday wear and tear, correspond to the applicable legal provisions and are free from hazardous substances. Our products are thus comprehensively tested by us as well as by independent institutes. Only once all criteria have been fulfilled are DICOTA trademarked products put up for sale. Our carrying solutions go through 1,000 cycles in the lab during testing. The bag is filled with a weight of up to 25 kg and then hung by the carrying handle or shoulder straps. Every 4 seconds the product is dropped a distance of 9 cm. This realistic test allows the processing quality to be tested and the reliability of the material to be ensured. 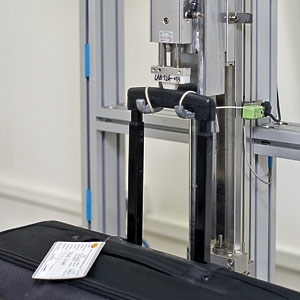 We conduct mechanical tests to ensure that trolley components are up to the challenge of everyday wear and tear. The wheels of our trolleys are tested on a roller conveyor over a distance of up to 200 km. The trolley is weighted down depending on bag size and the telescopic handle is additionally loaded. We thus simulate a test environment that is as realistic as possible. Our checks mean we can be sure of delivering quality products, and promise you the same certainty. The extensive guarantee standards highlight the longevity of our products. Despite strict quality tests, defects may occur in products, which is why DICOTA offers a lifetime* guarantee for potential material and processing defects on notebook bags. Additional information on our comprehensive guarantee services can be found. here. DICOTA quality starts with the personal consultation and goes beyond the product purchase. Your wishes as well as your criticism take top priority for us. Help us to continually improve. Our employees will take care of your enquiries quickly and easily..